Just Nutritive Sunless Tanning Lotion earned 3 out of 5 stars after I tested it out. It’s hydrating and easy to use, which are both positives. The smell isn’t bad, but it does smell like self tanner the next morning. I ended up having mixed feelings on whether I liked my tan or not. At first, I did because it was dark and streak free. But once I went outside in the natural light, I realized my tan had an orange hue to it, which made it look like a fake tan. I think the color will look more natural on those with olive skin tones. My tan lasted about 4-5 days which was good. Although, it didn’t look very natural as it faded. So overall, this has its pros and a few cons as well, so I ranked it 3 out of 5 stars. This self tanner is a very thick, white cream. It doesn’t have any immediate color to it. The texture is very emollient and hydrating. I didn’t use a tanning mitt when I applied this one because I wasn’t too worried about it staining my palms. I kind of wish I used a mitt in hindsight because my palms ended up slightly orange. Other than that, applying it was okay. It goes on like you’d apply your normal body moisturizer. You can’t see where you’re applying it due to the lack of guide, so just make sure to cover all areas. Although it’s white in texture, it’s pretty thick, so it takes a while to blend in. It stayed white on my skin for a few minutes before completely blending in. At least application was very clean, and I didn’t have a guide staining anything! Because of how thick Just Nutritive Sunless Tanning Lotion is, I thought it would take forever to dry. It took about 20 minutes to completely dry, which is pretty average. I was okay with the drying time, although it was a little sticky while I waited for it to dry. The nice thing is I could throw my clothes back on after 20 minutes, and I didn’t need to worry about the tanner staining anything because it doesn’t have a color guide. The smell of this self tanner is light and citrusy. The smell was okay; I didn’t mind it, but it also wasn’t my favorite. The citrus scent reminded me a little of cleaning products, but it’s better than smelling DHA! The next morning I woke up and could smell some DHA. The citrus smell was also gone, so the smell wasn’t very pleasant. After I showered the product off, I was happy with how my tan looked. It looked dark and sunkissed. However, when I went outdoors, I noticed that my tan had an orange tint to it. The orange color was only visible when I was in natural lighting, but it still made me self-conscious. It wasn’t the worse color ever, I’d rather be orange than pasty white, but for some of you, this one will definitely be too orangey. I kind of had mixed emotions about the tan it gave me, because on one hand I liked how dark it was, but on the other, it looked orange outside. I think this self tanner would be a better fit for those with deeper olive skin tone. I didn’t notice any streaking or patchiness with this one, so that’s a plus. My tan lasted 4-5 days with Just Nutritive Sunless Tanning Lotion. I was happy it lasted this long, although I wish the color was more natural looking on my skin. As it faded, it looked pretty bad. I had some areas, like in my elbow creases, that looked so scaly. Only if you have a darker complexion to start off with, or else I think it will be orangey on you. Just Nutritive Sunless Tanning Lotion is $27.99 per bottle, which is $3.50 per ounce. That’s a good price, as it’s a little less than your average self tanner. 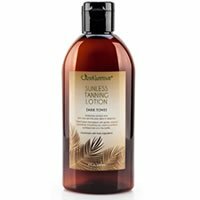 To buy Just Nutritive Sunless Tanning Lotion, Click Here. Look and Feel This is a very thick, white creamy lotion. Application Applying isn’t messy, but it took a few minutes to blend in. Drying Time It took around 20 minutes to dry and was a little sticky while it dried. Smell (Before) Smells light and citrusy. Smell (After) Smells like DHA (self tanner) the next day. Color Produced My tan was dark, but it had an orange hue when I went outside. OK For Men? Only if you have a darker skin tone to begin with. Price It’s $3.50 per ounce, which is less than average.